I popped a bottle of champagne when Pei Pei / Hao Hao declared that she / he was diaper-free. However, I realised that I popped the champagne too early. That was just the beginning of another challenge when we bring them out - visiting public toilet! The difficulty level increases when I bring two of them out by myself. Before they were diaper-free, unless "explosion" took place, I could continue whatever I was doing for a while longer. 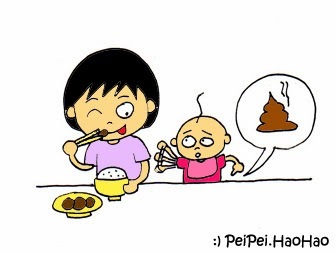 Pei Pei and Hao Hao are used to hygienic toilets at home (Salute to DaDi for polishing the toilets!). When we visit public toilets, once in a while, we see horrors which I don't wish to elaborate here. So I have to clean up the toilet seat with tons of toilet paper before they use it. Oh, sometimes I have to do this too. When I bring two children out alone, if one of them needs to go to toilet, it means that all three of us must go! I am worried to let them go to toilet by themselves as they are still too young. Of course, when I am the one who needs to answer Nature's call, two of them would have to join me in the call! 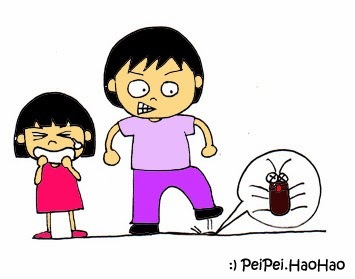 As a kan-cheong (panicky) mother, not only we go to toilet together, we go into the same cubicle together. Since the ratio of number of people to the toilet bowl is 3:1 inside the cubicle, the obvious question is, who first? I am definitely the last person. Sometimes, war takes place inside the cubicle if both of them are very urgent at the same time. Toilet bowls in some public toilets are designed solely for adults. Or they are designed based on the assumption that children nowadays are very tall. This is definitely not lion dance performance. So you can imagine how strong my biceps become after a "big business" session. Whenever I have to support them during the "big business" session, my eyes can only look at one direction - into the toilet bowl. Anyway, I am well-trained already. I can continue to eat after the session. So, how to overcome these challenges? Step 1: Teach them clean the toilet bowl using toilet paper. Step 2: Wait outside the cubicle instead of going in with them (Need DaDi's help to train Hao Hao). Step 3: Wait outside the washroom. Step 4: Let them visit the washroom by themselves without me moving away from my original location. Oh, these are still running in my mind, I haven't executed these steps yet! Shall pop another bottle of champagne again when they have mastered the art of using public toilets by themselves! 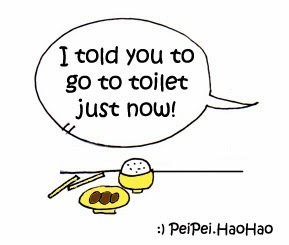 My toilet training days are years past (until I have grandchildren, that is) but this brought back some memories. I only had one to work with, not two, but my little guy, at one point, became fascinated with public toilets. Wanted to stop at every one and you didn't know if the need was real or not. Good luck and - yes- eventually it will get better. Alana from UBC. Thank you bookworm for sharing your experience! Love the cartoon! So true about cleaning the toilet seat! Lucky my girl can get on n off without help. Thank you Madeline! Great that your girl can get on and off without help!